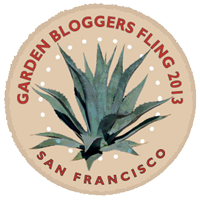 One of my favorite parts of the annual garden blogger meet-up is the chance to steal ideas. 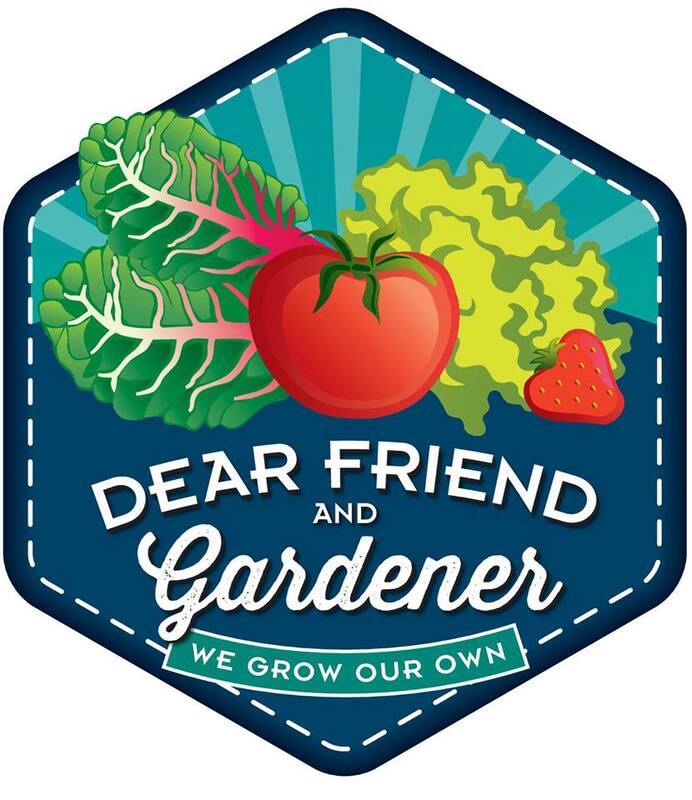 Or, maybe I should say, compliment other gardeners on their ideas. As in, imitation is the most sincere form of flattery. This year was no different and when I finally came home from an extended vacation after Fling I had time at last to pore over my photos and start to make plans for intense flattery. This year, being in the midst of a concrete fairy castle project in my own garden, I found myself noticing concrete projects in several of the gardens we were lucky enough to visit. 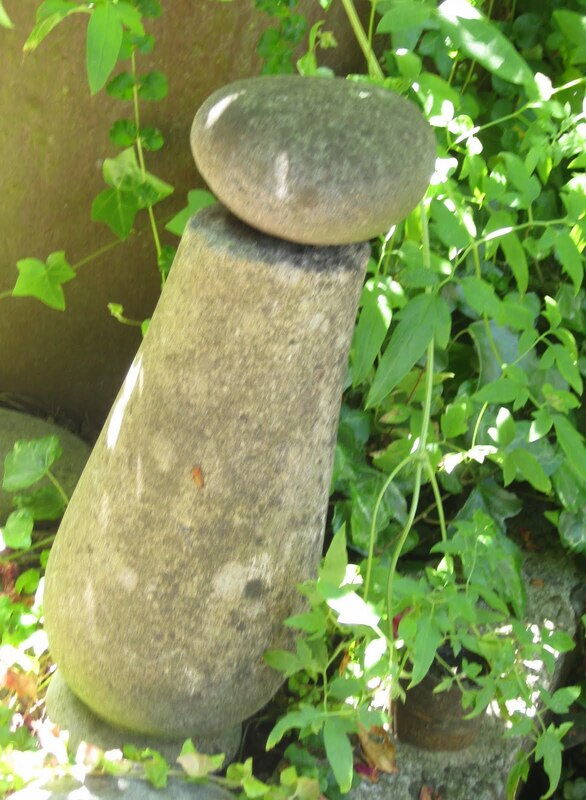 The pedestal topper above, seen in the garden of Karen Farley, looked to have been made with a large child's sand toy for the mold. 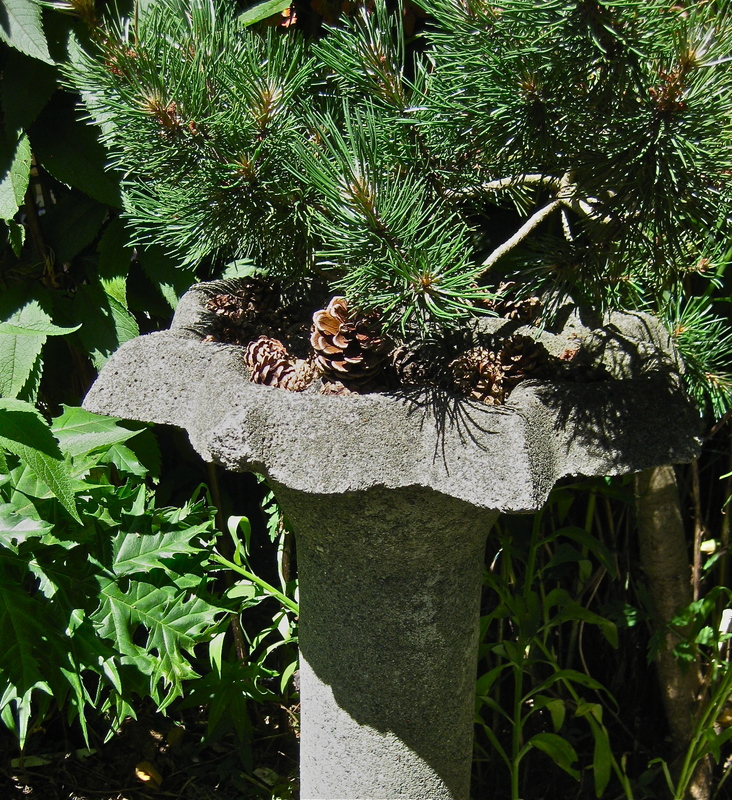 Hidden under a pine tree branch, it had several dividers some of which held pine cones and some succulents. This pedestal looked like it was made with a plastic form that could have been cut and peeled off after it was dry. I'm trying to think of what would work...I really like the shape. 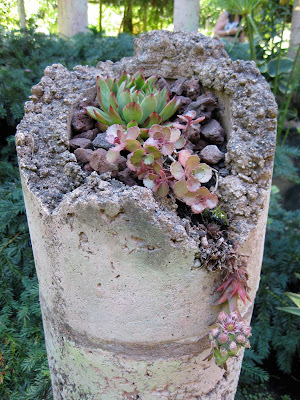 This faux broken pillar, seen in the garden of Denise Lane, looked absolutely perfect planted with succulents. I am of the opinion that almost everything looks better planted with succulents but this is a very cool two-fer...succulents AND concrete! In her garden full of wonderfully whimsical touches Lorene Edwards Forkner had many stealable ideas, several of them concrete. And it will be easy to copy these ideas because her new book Handmade Garden Projects:Step by Step Instructions for Creative Garden Features, Containers, Lighting, and More will be out very soon! Impatient person that I am I have, at this very moment, a trial sign for my fairy castle drying in my side yard. I bought letter stamps for concrete use several years ago...Lorene's welcome in her front path spurred me on to open the package. If it is a failure I will just have to wait for her book and then I'll get all the secrets! You saw a lot of things that I didn't. Concrete intimidates me. I have a similar kit with letters. I was going to make signs for various parts of our woods walk, but soon I will be moving to a new woods. I regret I couldn't see Lorene garden. I look forward to her book coming out. I missed some of those ornaments. You have a good eye. I bet a whiffle ball bat would work for the pedestal form. I'm also looking forward to Lorene's book. I think I'm ready to graduate from concrete stepping stones to something a bit more complicated. I can't wait to see pictures of your concrete garden fairy castle when you've finished it. These are all great ideas, too! I just read that Timber Press has a book coming out soon called Concrete Garden Projects: Easy & Inexpensive Containers, Furniture, Water Features & More. Sounds right up your alley. It was great seeing you at the Fling again this year! I've never been to a fling, but was a "maybe", so I get the Facebook emails. I haven't been able to look at all the photos, but have seen a number. I enjoyed seeing your post of ideas. Most of the photos I've seen have been of people having fun. I hope I find more photos of the gardens that were visited. I hope your project turns out well. I'm going through my photos too. Lots of ideas. Now to find the time to get to work. I've had tofa troughs on my list for a while.